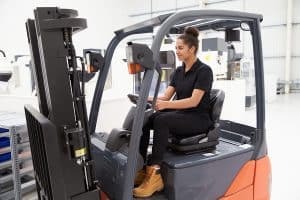 If you are considering a career in warehousing and logistics then it is worth learning how to drive a forklift, and also learn to drive it safely. Be of legal age. You must be at least 18 years of age to drive and operate a forklift. If you are any younger you will have to wait to get certified. Find a school that teaches workers how to operate forklifts and offers certification. If you work for a company that requires you to learn how to drive and run a forklift to do your job, get promoted or get a pay increase, then they may have a certification course which they send their employees to. The governing body for forklift training is OSHA or the Occupational Safety and Health Administration. Look for a program that is OSHA approved. You can usually contact a forklift dealer for advice. Courses can take one to two days. Some may take a few weeks. The cost is in the range of $300 to $1,000. Some are government subsidized. Usually your employer will pays the tuition to get certified and get a forklift drivers license. OSHA safety training. Once you have been certified by an accredited training facility to drive a forklift you also need to do an OSHA-approved safety course. This is a program that will train you in safety requirements to drive forklift equipment to the standards of the Occupational Safety and Health Association. You also have to be signed off on-site at the location you will be working at. Once you get a forklift drivers license, you will be ready to work. This allows you to drive a forklift in a professional warehouse or distribution facility environment. Still have questions? If you have any further questions, that have not been answered by this post, then contact any forklift dealer office.